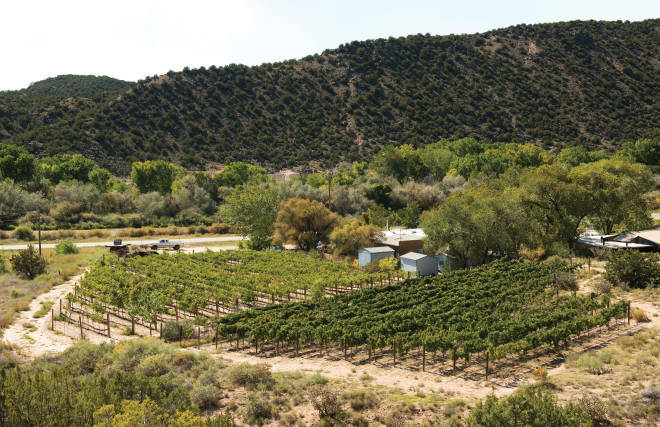 Above: Black Mesa Winery&apos;s vines hug the Rio Grande. Photograph by Douglas Merriam. Take a rest at one of these wineries between Santa Fe and Taos and sample New Mexico’s impressive new vintages. Pick up a bottle to enjoy with a picnic lunch at the summit of a leisurely hike from the ski valley to Williams Lake. Pull off the road in Velarde for a taste of the lush and fruity pinot grigio, the rich cabernet sauvignon, and the fruity but not sweet rosé. While you’re there, try Bite Me, a hard apple cider (1502 NM 68, Velarde, 505-852-2820, blackmesawinery.com). About six miles north of Black Mesa you’ll find this roadside winery where you can taste a lineup of intense reds and diverse whites, plus dessert wines, handcrafted chocolates, and house-made cheeses (2075 NM 68, Dixon, 505-579-4441, vivacwinery.com). From Vivác, turn up the High Road to Taos and drive three miles to the village of Dixon to visit this lovely winery (NM 75, Dixon, 505-579-4437, lachiripada.com). Try the affordable, quaffable Winemaker’s Select Red and White. There’s also a tasting room in Taos (103 Bent St., 575-751-1311).